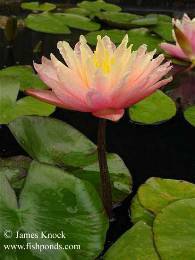 James Knock, who lives in the United Kingdom, has been a dedicated collector of Strawn waterlily cultivars for many years and is an expert in their identification and cultivation. Most cultivars were obtained directly from Strawn Water Gardens in the years 1994 through 1998. In these galleries, James takes us through seasonal and age related changes in coloration of many Strawn cultivars. High summer in England, sometimes only two to three weeks long, provides the most dramatic colors of all, often not seen in other climates. None of the images have been color enhanced or color adjusted. A real show stopper this one! 'Barbara Dobbins' is one of those plants you just have to see in order to fully appreciate its true beauty. Colouration of this hybrid varies enormously, and is dependant on the maturity of the plant and available sunlight. 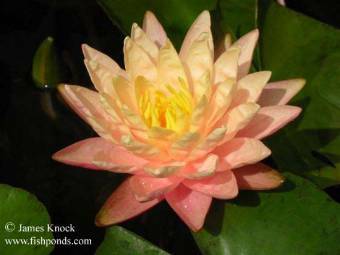 The first flowers of each season are generally yellow with a pink blush at their base. Then, as the plant matures and the available sunlight increases, something wonderful happens. The colours begin to fuse together creating a sumptuous peach effect. As if this weren't enough, in common with 'Barbara Davies', it pushes its blooms well above the foliage . . . truly stunning! It too has inherited N. mexicana's semi-evergreen habit and just refuses to stop growing! It's not at all uncommon to see blooms being pushed up in the middle of the British winter, though sadly the days are too short for them to open. The petals of this hybrid are quite thin, almost like tissue paper, and during cold spells they often take on a crinkled effect. With the onset of warmer weather, plants generally grow out of this crinkling. This hybrid is very free flowering, producing rather large blooms over a very long season. It can be viviparous, making new plants from its flowers.